I was inspired to create Cookie Monster cupcakes from the fabulous baker at hellotherecupcakes, who has the decoration down to a T. I used the BBC good food recipe for my batch of Cookie Monsters. After doing some research, I realised that most Cookie Monster cupcake recipes use desiccated coconut to create the fur effect on top of the butter cream. Because I hate coconut, I decided to add blue dye to the butter frosting. I bought edible eyeballs in case piping my own did not go as planned. My first problem arose when I cooked the batch of cupcakes. The above recipe suggests 50 grams of sugar, 50 grams of butter, and 50 grams of flour. The mixture did not even make six cupcakes, and the five it did make were small. I tried to decorate the small cupcakes as best I could. When I tried to lift him up for a better picture, the cookie fell out of his mouth. In the end, I had to put him out of his misery. He was clearly in pain. So I threw away the small batch of cupcakes and started again, this time with 200 grams sugar, 200 grams of butter, and 200 grams of flour. The second batch was much better and made twelve decent sized cupcakes. The second problem arose when I realised I cannot decorate cupcakes. It is a lot more difficult than it looks, and while I was trying to smooth the butter cream with a knife I remembered bench scrapers exist, and that I probably should have bought one. Another problem: the eyes. The shop bought edible eyes made the Cookie Monsters look deranged, so I switched to hand made eyeballs after the third deranged looking cupcake. In the end, I did not get the result I wanted. I probably need to improve my piping skills. I bought one of these, and when it arrives I’ll try again. Quadruple the amount of flour/sugar/butter/eggs the good food recipe suggests. 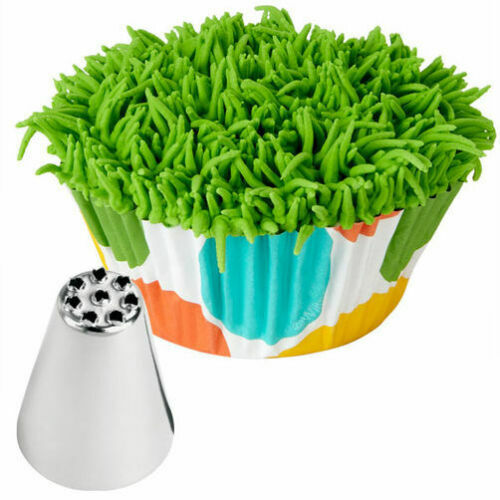 Purchase a GRASS/HAIR/FUR PIPING NOZZLE TIP from the beginning, and your butter cream will not look as dodgy. Alternatively, use desiccated coconut or blue sprinkles on top of the butter cream. Use gel dye instead of liquid. Gel has a more intense pigment: I had to use all of the 60ml blue liquid dye I bought at Tesco, and still did not achieve the Cookie Monster colour I wanted. My friend told me that my Cookie Monster cupcakes look like Nev the Bear cupcakes. So if all else fails, tell everyone that you made a cupcake tribute to Nev the Bear.